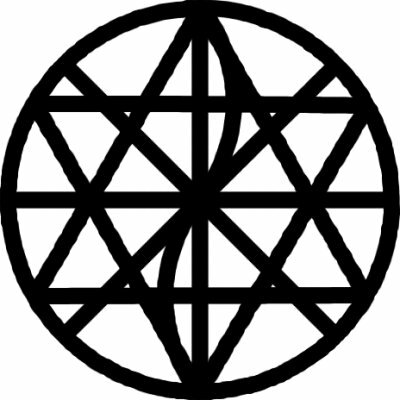 The coinherence symbol designed by Professor Roger Corless (Duke) in 1983, combining the symbols of various religious traditions. 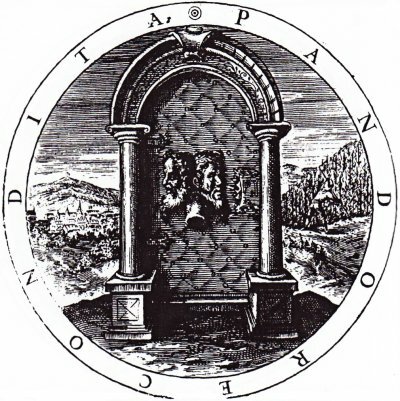 As the logo of the Duke University Department of Religion, it combines 7 symbols (circle, taijitu, wheel, hexagram, labarum, crescent, cross); the logo of the University Religious Council (URC) at UC Berkeley adds 4 more (point, atom, chalice, lotus). 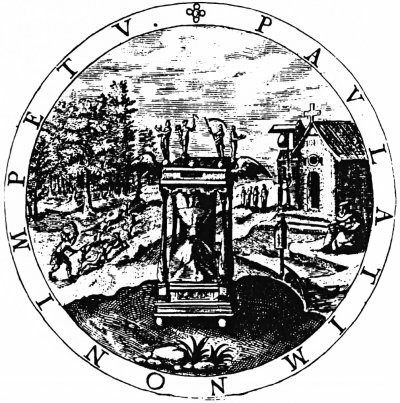 The symbol combines its constituents “in such a way as to represent simultaneously the full and autonomous presence of each tradition and their intimate interrelation, each inside the other, in the mode of coinherence” (URC). Meister Eckhart on coinherence: “There is a difference between spiritual things and bodily things. Every spiritual thing can dwell in another but nothing bodily can exist in another. There may be water in a tub, and the tub surrounds it, but where the wood is, there is no water. In this sense no material thing dwells in another, but every spiritual thing does dwell in another. Every single angel is in the next with all his joy, with all his happiness and all his beatitude as perfectly as in himself; and every angel with all his joy and all his beatitude is in me, and so is God Himself with all his beatitude, though I know it not” (Meister Eckhart: Sermons and Treatises, translated and edited by Walshe, vI p50; appearing in Corless’s Many Selves, Many Realities, 2002). 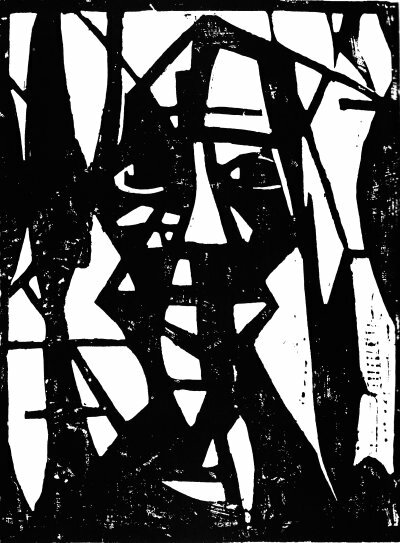 Four woodcuts from German Expressionist Woodcuts, 1994, edited by Shane Weller. “Expressionism was in part a reaction against Impressionism‘s emphasis on atmospherics and surface appearances, and against academic painting’s rigid technique, stressing instead the emotional state of the artist and subject… creating an experience rich in drama that conveyed the inner reality of the subject matter” (pvii). 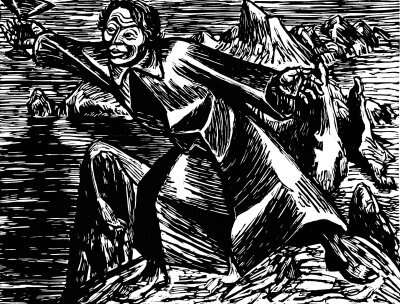 Ernst Barlach. To Joy, 1927 (p1). 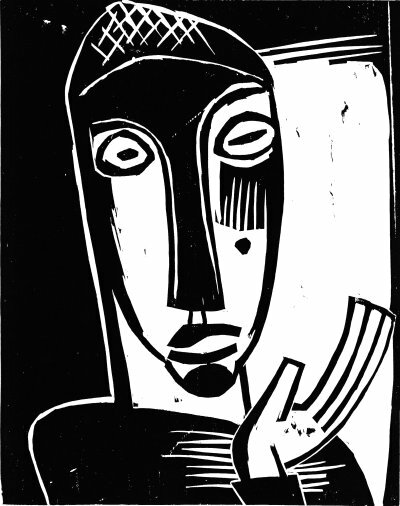 Ernst Ludwig Kirchner. 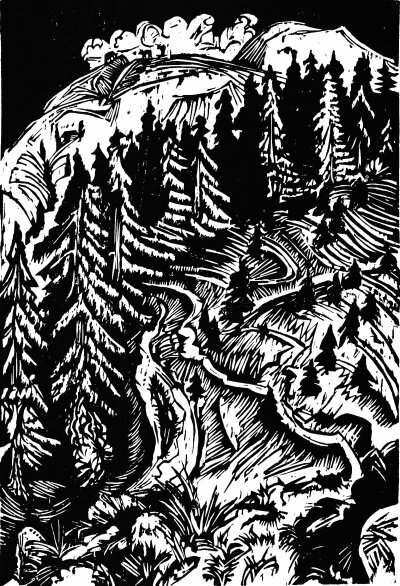 Three Paths, 1917 (p47). Christian Rohlfs. Large Head, 1922 (p100). Karl Schmidt-Rottluff. Prophetess, 1919 (p115). 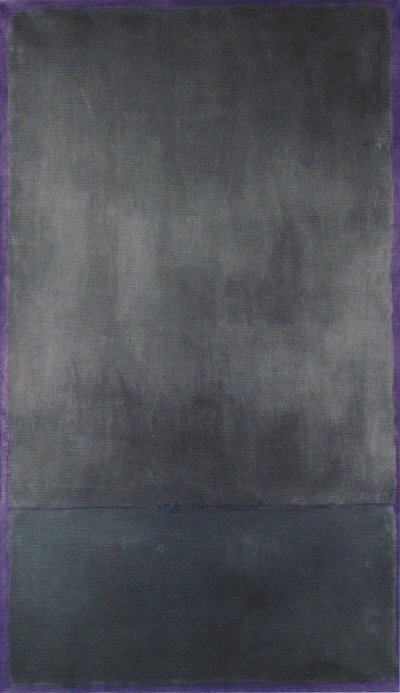 Two Rothkos from Jacob Baal-Teshuva’s Rothko (2003 Taschen edition). “The aim of his life’s work was to express the essence of the universal human drama” (p17). 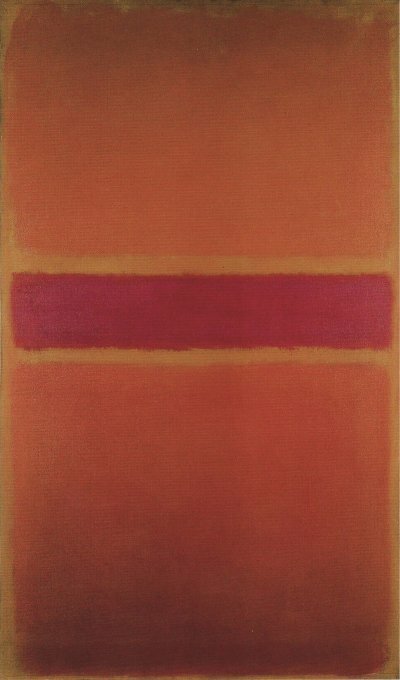 Said Rothko, “‘Any picture which does not provide the environment in which the breath of life can be drawn does not interest me'” (p45). “‘Silence is so accurate,’ he said, adding that words would only ‘paralyze’ the viewer’s mind. In one conversation he said, ‘Maybe you have noticed two characteristics exist in my paintings; either the surfaces are expansive and push outward in all directions, or the surfaces contract and rush inward in all directions. Between these two poles you can find everything I want to say'” (p50). “On another occasion, he announced that, ‘A painting is not about experience. It is an experience'” (p57). 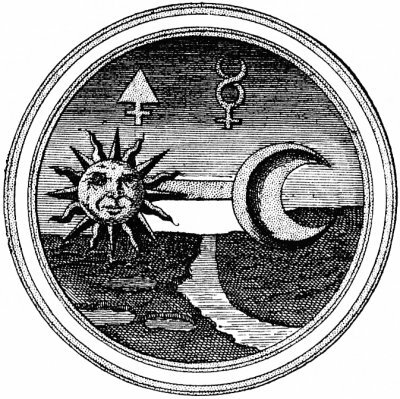 Four illustrations appearing in E. J. Holmyard’s 1957 Alchemy, a historical account of exoteric alchemy. 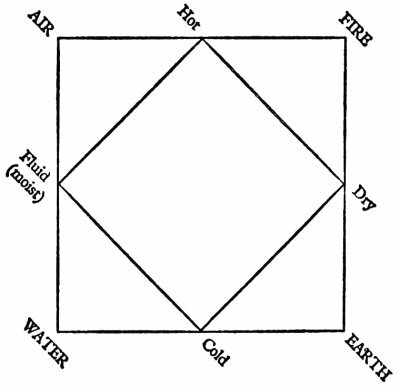 First, a diagram (p22) of the Greek conception of the four elements — fire, air, water, and earth — in relation to their qualities — wet (fluid, moist), dry, hot, and cold. Each element is described, unequally, by its two adjacent properties; thus fire is primarily hot and secondarily dry, air wet and hot, water cold and wet, and earth dry and cold. 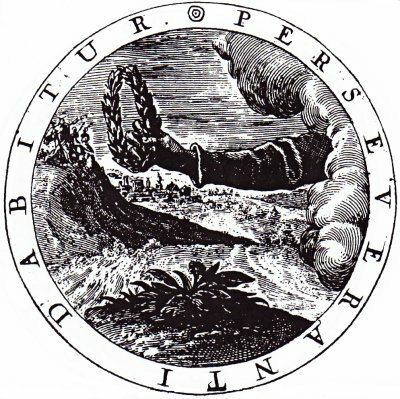 “None of the four elements is unchangeable; they may pass into one another through the medium of that quality which they possess in common; thus fire fire can become air through the medium of heat, air can become water through the medium of fluidity; and so on” (p22). 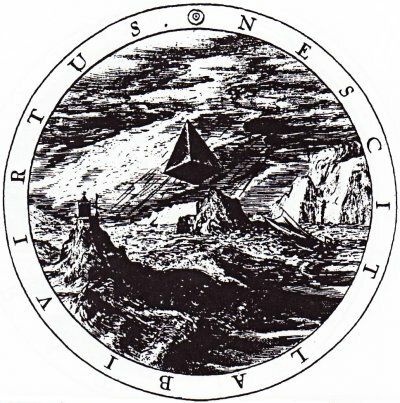 This system (with earlier roots, and similarly present in other cultures) was conceptualized by Aristotle (384 BC — 322 BC), who “argues that each and every other substance is composed of each and every ‘element’, the difference between one substance and another depending on the proportions in which the elements are present… It follows that any kind of substance can be transformed into any other kind by so treating it that the proportions of its elements are changed to accord with the proportions of the elements in the other substance. This may be done by change of the elements originally existing in the first substance, or by adding some substance consisting of such proportions of the elements that when the substances are mixed or combined the desired final proportions are attained” (p23). 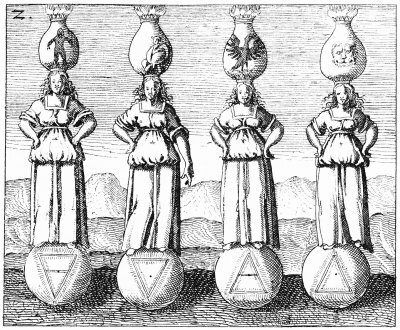 The spherical fundaments display the alchemical symbols of the four elements (earth, water, air, fire, from left-to-right), while the flaming flasks atop represent so-supported stages of the Work, blackening, whitening, yellowing, reddening, which color changes describe successive objectives of the various alchemical operations: calcination, sublimation, fusion, crystallization, distillation, and putrefaction, among other processes. 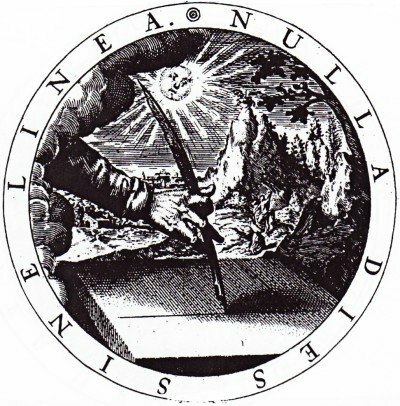 “The Grand Hermetic Androgyne trampling underfoot the four elements of the prima materia. 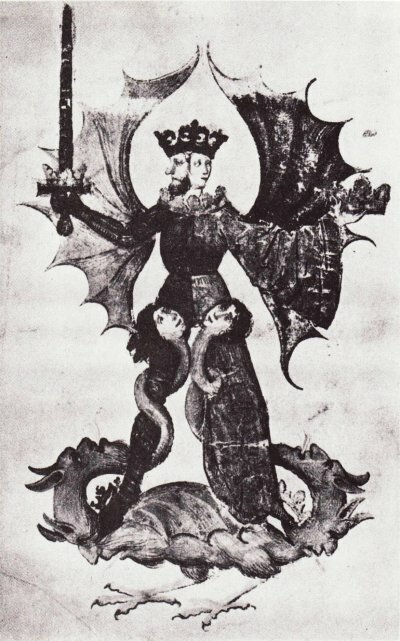 From the Codex Germanicus 598″ (plate 34). 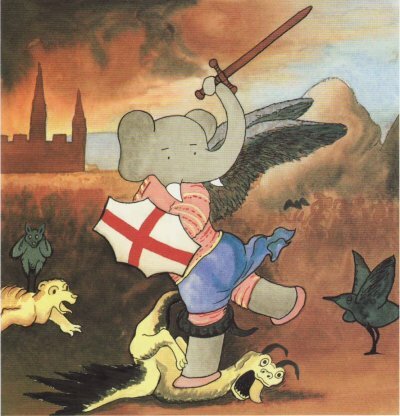 A Laurent de Brunhoff adaptation of Raffaello Sanzio‘s Saint Michael and the Dragon from Babar’s Museum of Art, 2003 (p15).